Inventory prepared by R.Simons. Owner.27-07-2016. One design cruiser/racer with 7 beds in a 3 cabin layout launched in march 1989. I bought it in 2003 from first owner in UK. Builder Westerly Yachts LTD. Yard no: YF 108. Year 1988 lauched in march 1989. Loyds certificated. LOA 32.10” (10.12 m.) Beam 11 “ Registerd tonage 8.56 Tons. Rig: Masthead. Desiner: Ed Dubois( whitebread races ).Volvo Penta overhauled in 2002 18 HP. Volvo Penta 2 cylinder diesel 18 HP. New water pump 2003. 50 amp alternator. 2 x batteries new 2014. Solar panel trickle charger on coach roof with regulator under chart table charging domestic battery. Fixed propellor with rope cutter on shaft. Fuel capacity 18 gallons ( approx 70 ltr.) Fuel consumption 2 ltrs per hour at 2.200 rpm. Two stainless steel watertanks totalling 80 gallons. ( one forward 30 gallons, one after 50 gallons. Both with automatic electric pumps working on water pressure. Double spreader masthead rig with stainless steel shroud plates. Stainless steel standing rigging ( new 2000 ) with split backstay and backstay adjuster. Roto stay 2 reefing gear with removable drum. Roll foresail system. Spinnaker pole and sheets/guys-blocks, downhaul and uphaul. Kicking strap.Topping lift. 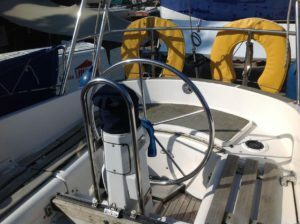 Slab reefing, lines led to cockpit.Signal halyards.Harness lines on deck. Mainsails. Ratsey & Lapthorn and North. No 1 Jib 23.31 m2 Brand new march 2016 not used ( invoice value Euro € 2.449,–). No 2 genoa ( race sail) by Ratsy & lapthorn with sacrificial strip.Excellent status. No 1 Medium Genoa North. Very good status. Spinnaker 1 x 1056 sq ft.
Spinnaker automatic opening cover system. UV protection cover for foresail. UV protection cover for mainsail. Custom made layjacks for main sail. White hull with dark blue boot line. 35 lb plough anchor with 50 ft calibrated chain.Simpson lawrence manual windlass. Stainless steel bow wand stern pulpits with gate. 2 foredeck, 4 midships and two stern cleats. Drained gaslocker with two gas bottles. Manual fitted bilge pump with handle. 2 Bulkhead compasses new 2010. 2 two speed halyard and 2 two speed foresheet winches. 4 winches handles. Sprayhood new 2008. Spare sprayhood with cockpit tent new 2000. 2 pockets. New 2008. Tiller steering woth cover. Spare tiller.2 splashsails new 2008. Spinlock tiller extension with spare. Twin foresail tracks with car for each. Mainsheet track and traveler. Named dodgers.Boat hook. Navico 6500 ( mariphone) VHF radio with windex arial at masthead. Raymarine ST 60 instruments ( new 2000 ).Windspeed and direction, dept hand log,, multi. Auto helm ( raymarine) 4000 Tiller pilot ( new 2000) with fluxgate compass. JRC radar ( new 2000) all interfaced with Fixed Garmin GPS.Barometer.Findell Radar reflector fitted to mast. Double berth forecabin with hanging locker and washbasin. Port and starboard single settee berths with lee cloths. Charttable with seperate chart seat. Flavel Vaness gas cooker ( new 2000 ) with two burners, grill and oven. All gaslines and regulator renewed 2000. Rubber gasline to oven renewed 2011. Battery charger Victron blue power 220 v- 12 Volt 17 amp . New 2012. Converter 12 v – 220 V. New 2012. Twin stainless steel sinks in tilled worktop,cutlery draws.Chopping board. CD/Radio withinternal and external cockpit speakers. Seperate heads with mirrod cupboards and sink. Rear cabin with twin berth and hanging locker. New cushions fitted 2000.Headlining to main cabin forward and rear cabins renewed winter 2002.New cabin floor 2005. New main cabin hatch fitted feb 2003. New toilet ( waterpump). New 2004. Yacht papers. Manufacturer instructions, handbooks for fitted equipment.Westerly owners handbook. Cutlery and plates/glasses/cups and mugs. Personal navigation equipment incl sextent & binocular. Flatsreen television mounted to wall with turnable bracket. 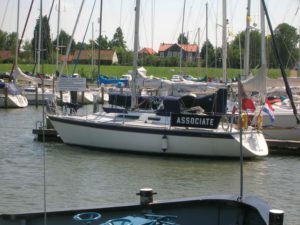 After purchase in 2003 yacht was only sailing on sweatwater lakes in holland. During winter period ( 6 month’s each year ) yacht was removed from water to avoid osmose. Each year engine has been controlled and adjusted by dutch Volvo penta dealer. 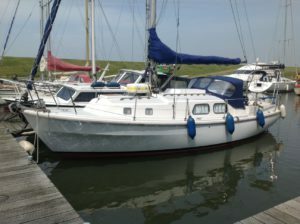 Yacht is in a complete excellent status and is immediately available.